Penn hosts American in the women's NIT on Friday night at the Palestra. If you want to watch some postseason college hoops in person, you’re in luck. Penn, Villanova, and Drexel’s women’s teams have punched tickets to the Women’s National Invitation Tournament. On Friday, ''Nova will host Old Dominion, Penn will host American, while Drexel will play at Harvard. The Wildcats (18-12, 9-9 Big East) will be without starting guard Kelly Jekot, who hurt her knee during their Big East Tournament quarterfinal loss to Georgetown. Villanova finished fifth in the Big East and was the conference leader in assist-to-turnover ratio. The Wildcats ranked second in the Big East in three-point field goals made. Old Dominion head coach Nikki McCray-Penson, in her second season in charge of one of women’s basketball’s traditional powers, resurrected the team from eight wins in 2017-18. McCray-Penson described last season’s shortcomings as the program building a culture. This season was about being rooted together. McCray-Penson was an assistant to Dawn Staley at South Carolina. McCray-Penson was diagnosed with breast cancer in 2013 and has been in remission for five years. In the midst of rebuilding the Monarchs, she lost her mother and grandfather last year. The Quakers (23-6, 12-2 Ivy League) came up short for an at-large bid after losing the Ivy League Tournament final to Princeton. They have an excellent opportunity at home against an American squad (22-10, 16-2 Patriot League) that ranks No. 71 in the RPI. Penn is No. 57. The Eagles are 3-2 in March; Penn is 5-1. The Eagles got an automatic WNIT bid after losing the Patriot League Tournament championship game last week. The Eagles ranked second in the Patriot League in three-pointers made behind conference champion Bucknell. 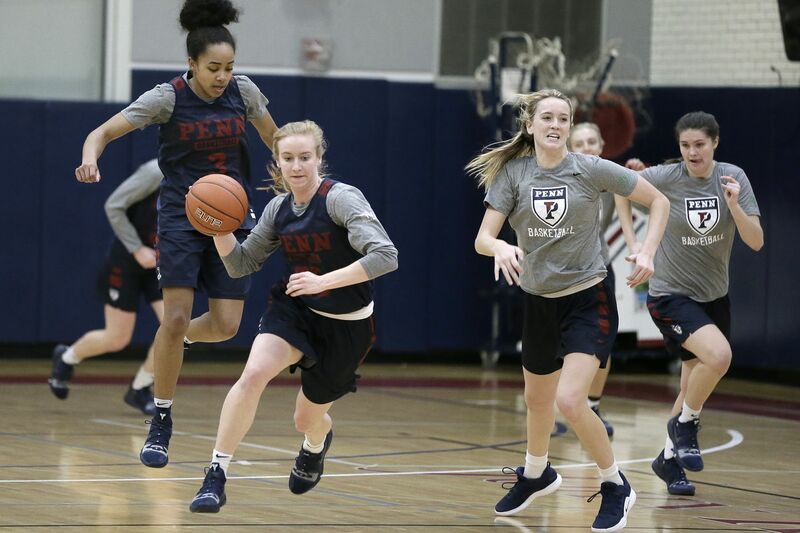 Penn, which led the Ivy League in perimeter defense, has a strong post combo in Eleah Parker and Princess Aghayere. Denise Dillon’s message to her players was simple: “Here you have a chance to show you are a little better than we finished last week. That’s exactly what we’re expecting." Drexel (24-8, 14-4 CAA) is ranked No. 1 in the country in scoring defense and No. 1 in the CAA in perimeter defense. The Dragons also led the CAA in assists per game. Drexel had a 14-game road winning streak this season. Harvard (16-12, 9-5 Ivy League) finished third behind Penn in the Ivy standings. Dynamic guard Katie Benzan leads the Crimson, averaging 14 points and four assists a game. The Crimson move the ball extremely well and led the Ivy League in assists per game. Last month, Drexel had a shot at an at-large bid to the NCAA Tournament. Although that didn’t work out, Dillon is happy that her team can just go out and play. These teams met in the 2013 WNIT, with Drexel wining, 82-72.